Since 1997, Senigallia has been awarded the prestigious Blue Flag certification, which FEE (Foundation for Environmental Education) gives to beaches that ensure bathing water quality certified by constant sampling made every 30 days, attention to the environment, services and safety on the beach. Child-friendly beach, with clear and shallow water close to the shore, clean sand, bathing establishments and specific areas for child care. 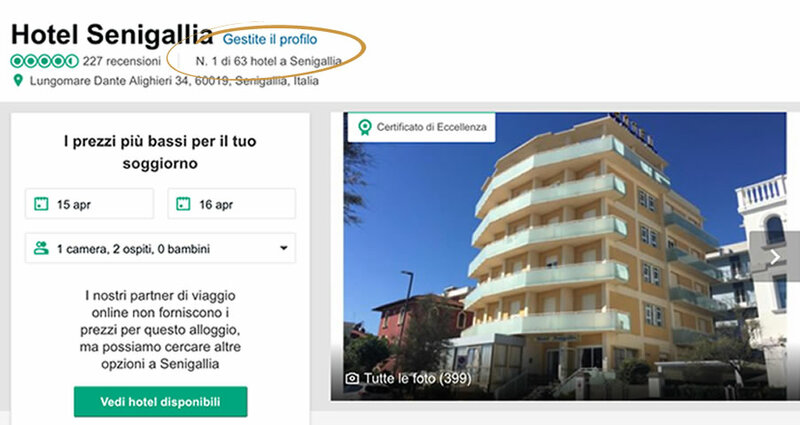 The Green Flag certification is awarded by a selected group of Italian pediatricians: Senigallia has long been one of the locations where children are welcome. On the Velvet beach, a couple of kilometers away from our hotel, there are dedicated and equipped bathing establishments for tourists to enjoy the sea with their beloved four-legged friends. On the velvet beach you will not only get tanned, but also keep fit. Gym on the beach is a fitness trail on Senigallia seafront with five stations: three of them are in the port area and two on Alighieri promenade. While doing your activities, you will be able to check the level of difficulty and the burned calories in real time by means of a special app (Norwell Outdoor Fitness) available to all mobile phones. Traveling by bike from the beach to the center of Senigallia is easy and safe. The bicycle is the most popular means of transport with citizens all through the year and tourists during summer. The latter ones have learnt to appreciate the many cycle paths present throughout the area. The Rotonda a Mare di Senigallia is a harmonious example of seaside architecture that symbolizes the city, a real icon that has soon become an important part of the city identity. Rocca Roveresca is a must-see place when visiting the city of Senigallia. The Rocca (fortress) can be defined as an extraordinary history book: it is in fact the result of overlapping defense structures built since the city’s origins in a site of decisive strategic importance. Today it hosts art exhibitions and prestigious cultural events. Facing Rocca Roveresca, the Duke’s Palace was not designed to accommodate the Duke permanently, but as a state residence for the court and its illustrious guests, who could watch military parades taking place in the square from the windows. The fountain was built to remind the population of the reclamation of the Saline marshlands. The ducks represent the birds present in the wet area, while the water plays represent the control over waters, which once were carriers of diseases and now are a symbol of prosperity. The Portici Ercolani are one of the most characteristic urban elements of the city. Their name is reminiscent of Monsignor Giuseppe Ercolani (1677-1759), who designed them in the mid-eighteenth century by the will of Pope Benedict XIV, with the aim of hosting the renowned and constantly growing Fiera Franca every year. Today, under the Portici Ercolani, one hundred twenty-six Istrian stone arches that line the right bank of River Misa, one can relive and breathe the atmosphere of the golden years of the fair every Thursday morning for the weekly market. Foro Annonario is a welcoming circular square that hosts a daily picturesque fruit and vegetables market and houses numerous local food and wine shops under the portico formed by a complex of 24 columns with Doric capitals. Thanks to the recently completed redevelopment works, Piazza Garibaldi, also known as Piazza del Duomo, offers an urban landscape of great beauty and charm, with public buildings of great architectural value. It is situated a short way away from the Town Hall and the main street Corso II Giugno. While the late-Renaissance facade is sober, the pure Baroque interior looks rich and sumptuous. The Senigallia Della Rovere marina is a place of great beauty and charm, the natural continuation of a pleasant walk that starts from Corso Matteotti, continues along Corso II Giugno and River Misa, and then reaches the Adriatic Sea on the new tip of the Molo di Ponente (west pier). Lights and colors will fill your eyes at sunrise and at sunset, and the sound of the sea will accompany your steps. Piazza Roma is the heart of the city government. In front of the town hall you can admire the Nettuno fountain, commonly called "l'monc' in piazza" (the maimed one in the square) by Senigallia citizens since the statue has no limbs. The city is enriched by a huge work of urban art, the biggest ever made in the territory. The selected building is the city-side wall of the train station, which will take on a new look together with the underpass that connects the station to the center. The "Museum of sharecropping history": is located in the fascinating complex of Santa Maria delle Grazie, immersed in the green of the hills of Senigallia. The museum, with free admission, possesses two thousand objects exposed and is a point of reference for anyone who wants to know the daily life and work in the countryside of the Marche Region in the first half of the Twentieth Century. The first impact with the Museum consists of an impressive Renaissance Cloister and continues with thirty themed environments that retrace the steps of the peasant life: crushers, machines for the sorting of the grains, looms, hemp and a large wine cellar; all accompanied by beautiful historical photos by Mario Giacomelli and Mario Carafòli.